Before you know it, you’ll be headed to holiday parties at work, at church, amongst your friends and, of course, at your kids’ schools. 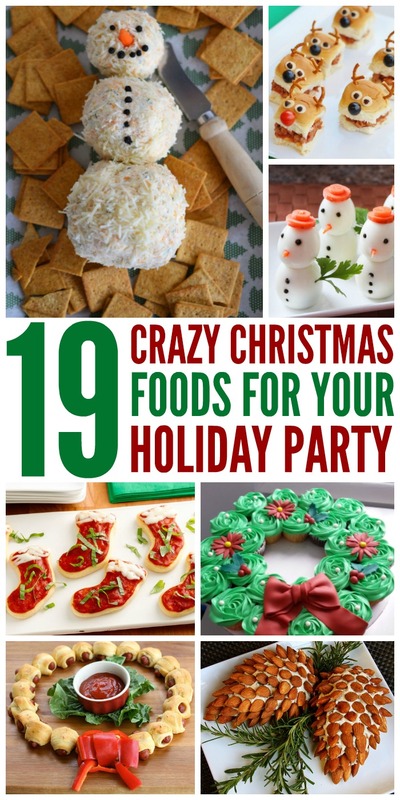 You need some festive foods to make and take with you. 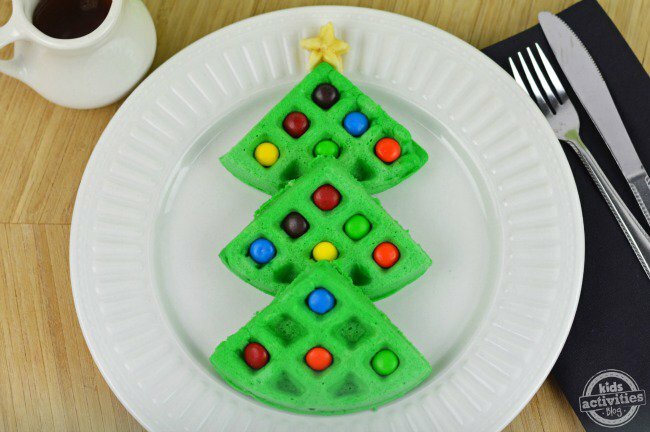 Here are 19 crazy Christmas food ideas that’ll make a big splash with everyone. 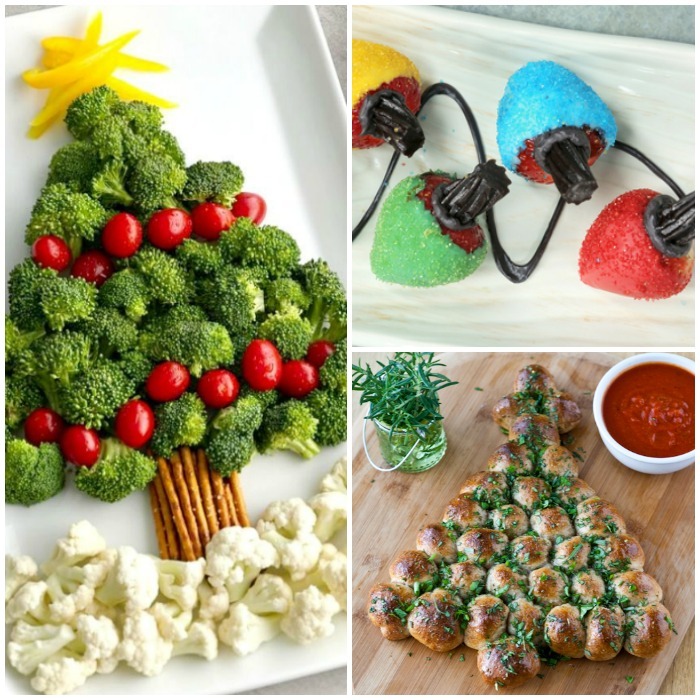 From appetizers to sweets, we’ve got you covered with cute, crazy, Christmas-y foods for merry-making. 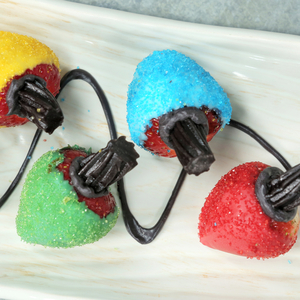 These multi-colored Christmas light strawberries are simply adorable. They’d make a cute garnish around a more elaborate dessert or would be lovely as a snack themselves. 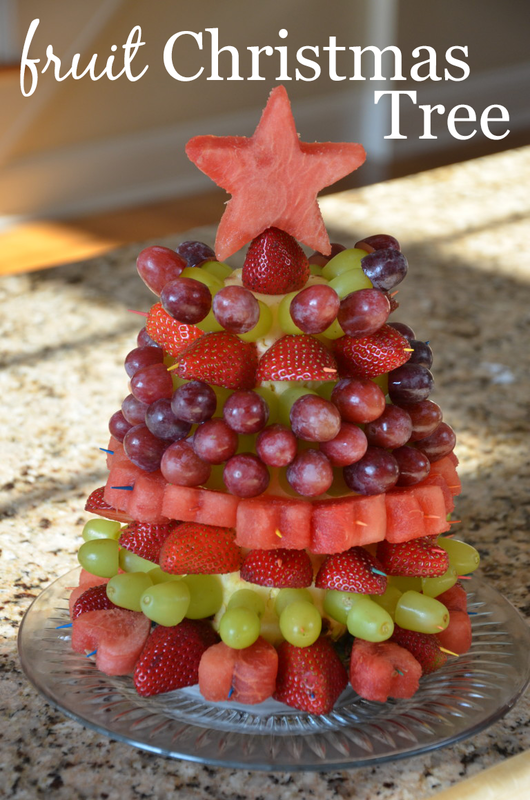 I can’t wait to make this fruit Christmas tree this year. At first, I was looking for the pineapple and then realized it’s the “trunk” of the tree. What a smart idea! 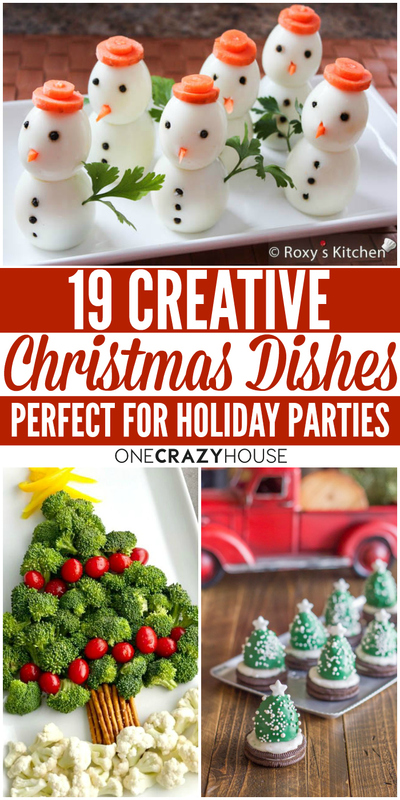 Take something savory to the office Christmas party. 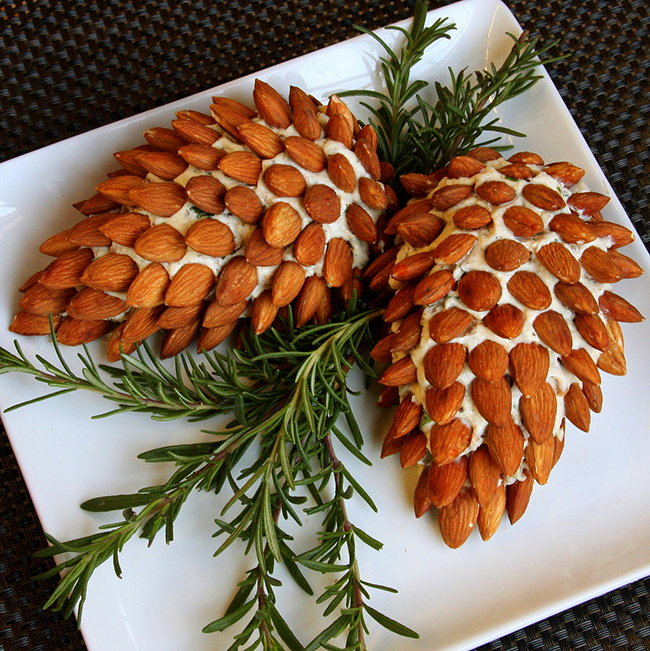 These pine cone cheese balls are delicious paired with your favorite crackers. And almonds just happen to be my favorite nuts! 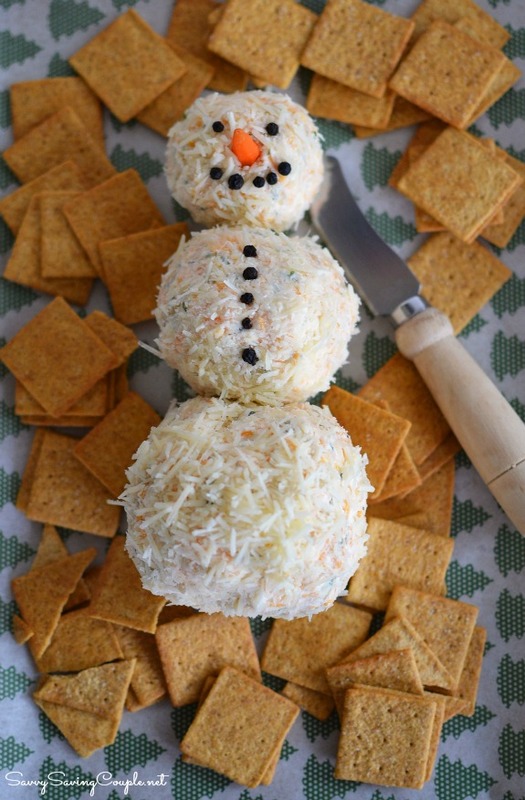 Or how about a snowman cheese ball for a kids’ Christmas party? 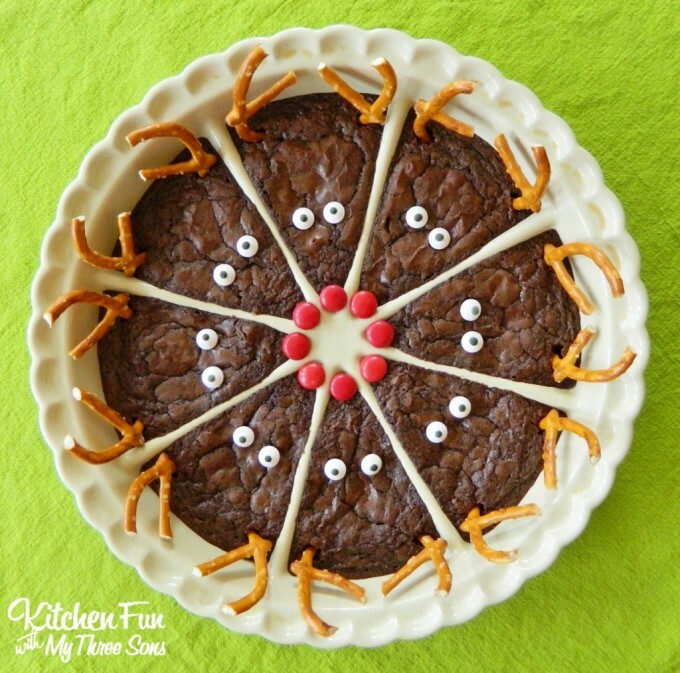 Reindeer brownies are the perfect holiday dessert – no special recipe needed. Just make your favorite brownies, and decorate as shown. 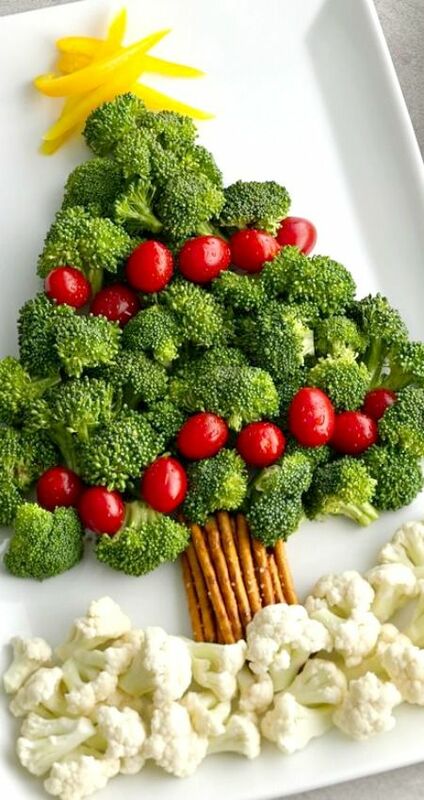 Get a huge dose of vegetables with this Christmas tree veggie platter. The tomato Christmas lights and cauliflower snow are a nice touch. 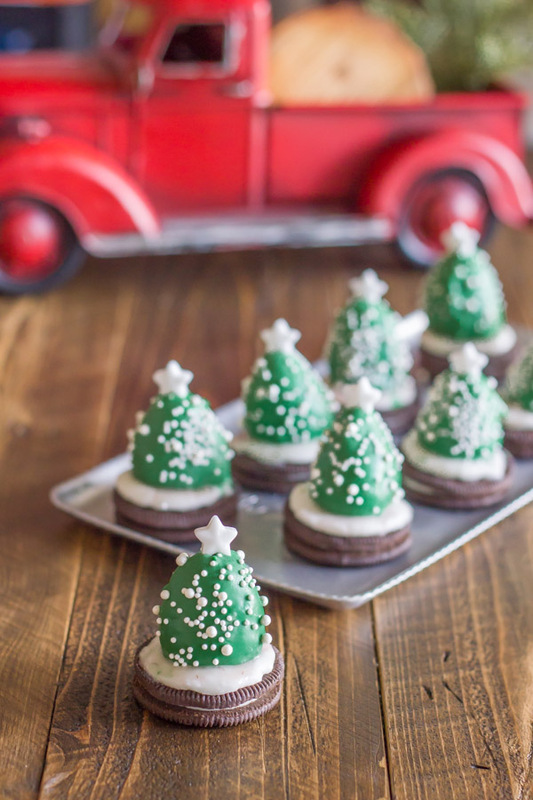 Use everyone’s favorite cookie as the base for these adorable strawberry Christmas trees. Don’t they look magical? 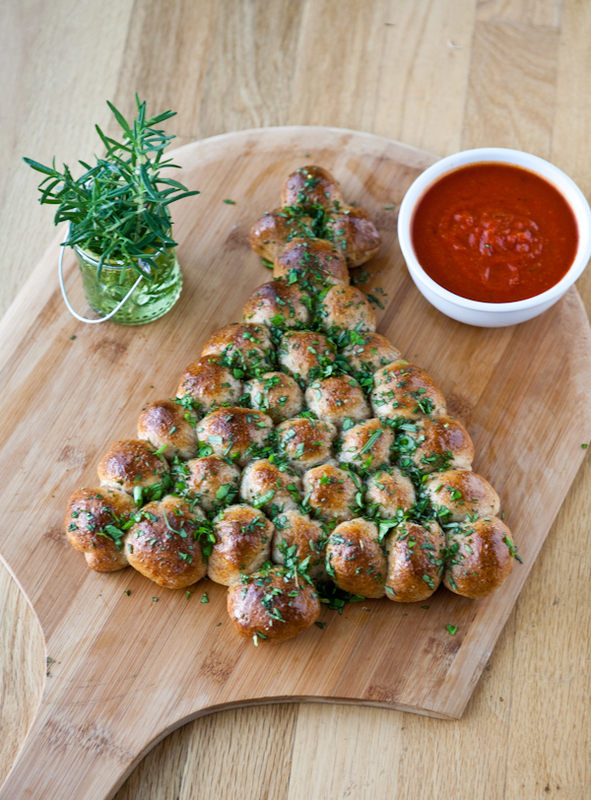 Make a tear and share Christmas tree of warm bread and gooey mozzarella cheese. Don’t forget the marinara sauce for dipping! 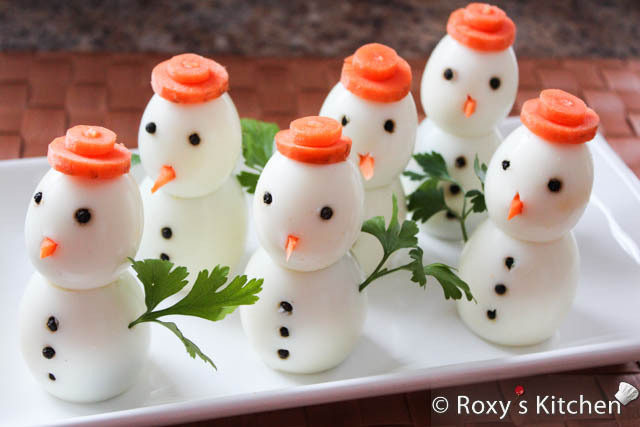 Egg snowmen make a wonderful holiday appetizer or a fun breakfast for the kids. The eyes and buttons are made with peppercorns… smart! 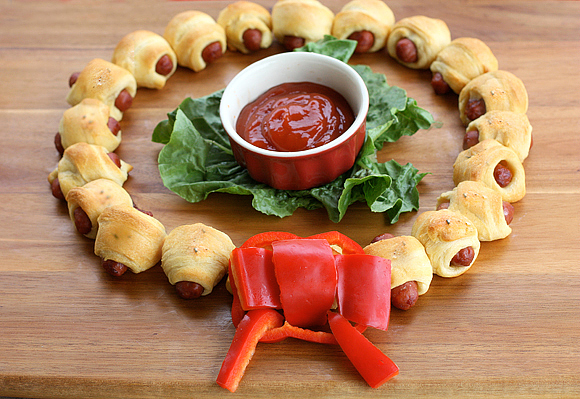 Everyone will go crazy for these crescent dog wreaths made with cocktail sausages and crescent rolls. 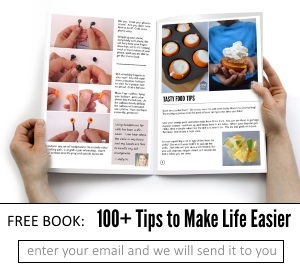 Make several of these because they go fast! 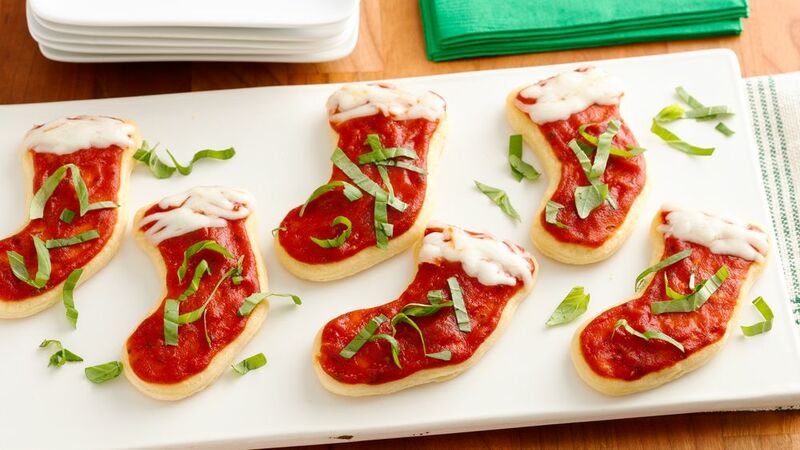 Make pizza stockings out of crescent dough, sauce and cheese. This is a great time to work in more veggies (like bell peppers and tomatoes) with the kids, too. Who doesn’t love a hearty Sloppy Joe? 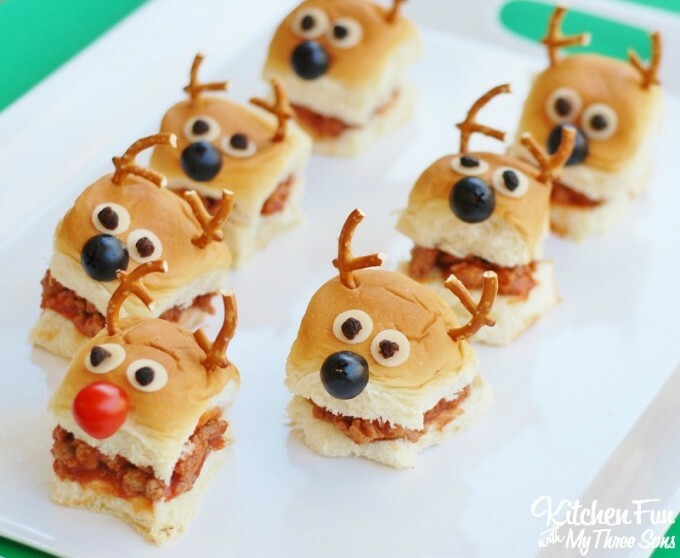 These were made reindeer style with a few embellishments. 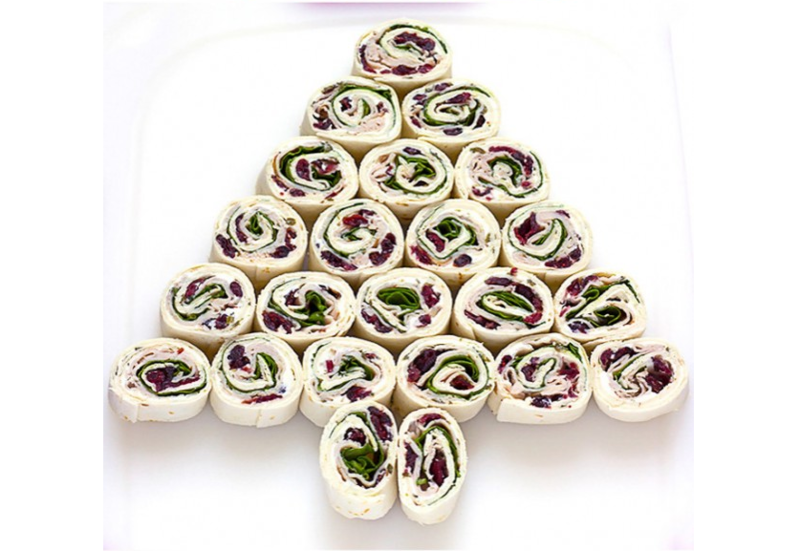 A stack of these turkey cranberry pinwheels will be gobbled up in a flash. Get it? Turkey… gobbled. I’ll see myself out. 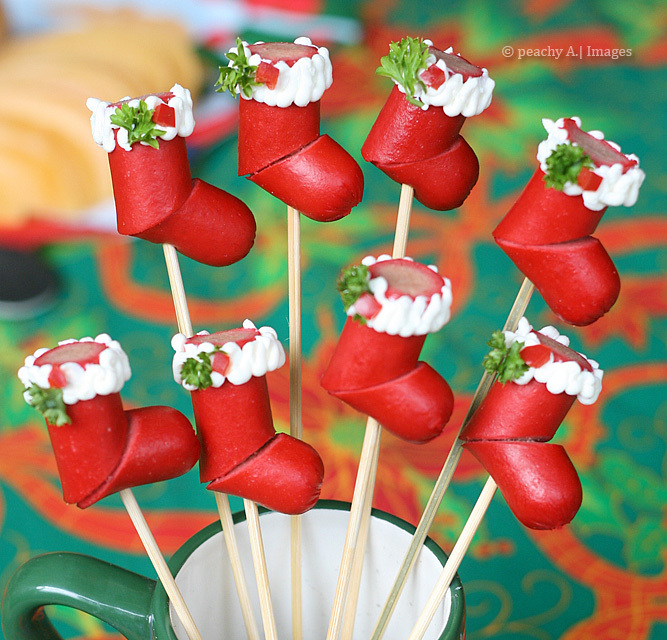 Stockings out of hotdogs? The kids will love it, that’s for sure. 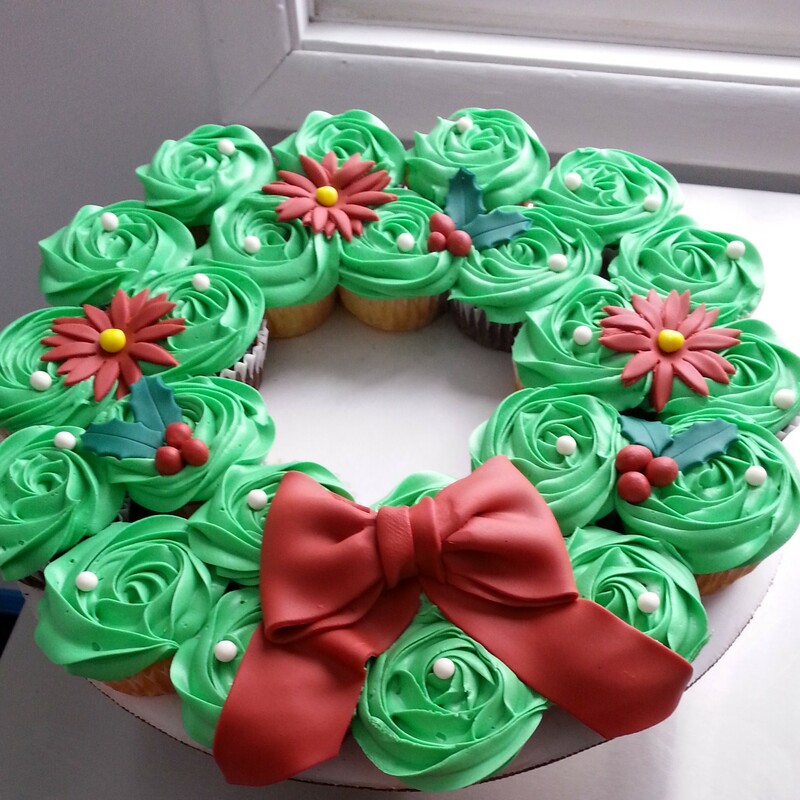 Make a gorgeous wreath with cupcakes topped with green icing. Add a few embellishments (like a fondant bow, poinsettias and berries), and it’ll look flawless. Kick your Krispie Treat game up a notch. 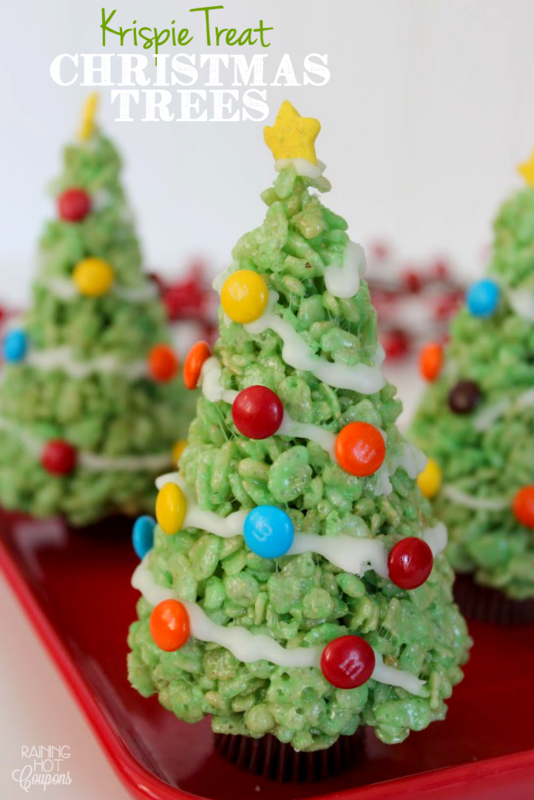 Shape them into trees, and add M&Ms and a marshmallow glaze to decorate the trees. 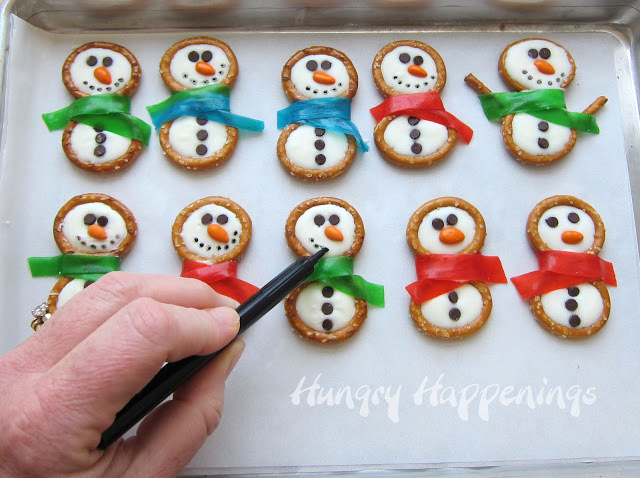 These pretzel snowmen are one of the cutest things I’ve ever seen. The pieces are held together by a fruit roll-up scarf and white chocolate. Isn’t that genius? Maybe you’d like to offer the kids a healthier snack? 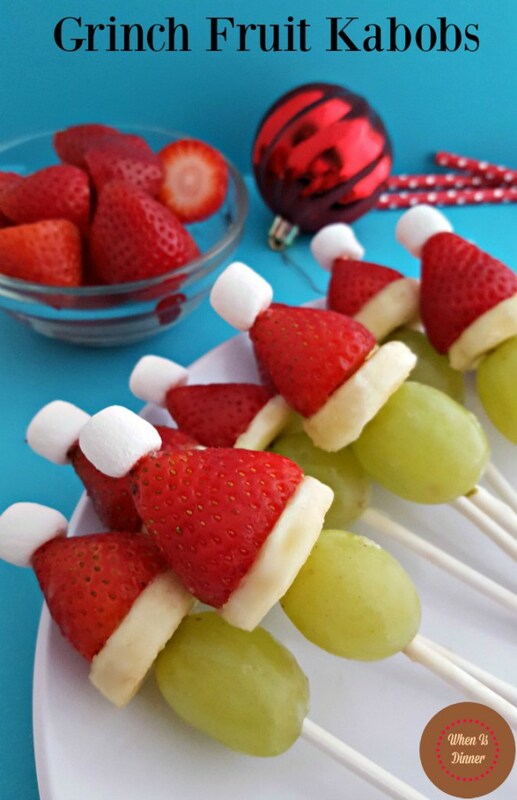 These Grinch fruit kabobs definitely fit the bill (marshmallow aside… but what’s one little marshmallow).